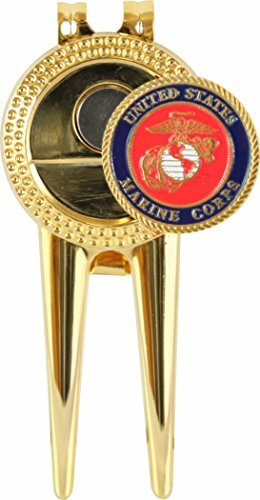 This US Marine Corps Divot Repair tool and ball marker are a MilitaryBest exclusive design. Made with a Gold Plating finish each repair tool measures 3 1/4" tall by 1 1/4" wide. The US Marine Corps Ball Marker is removable from the face of the Tool and is held in place by a strong magnet. The ball marker measures 7/8". Each Marine Corps Divot Repair Tool is sold separately and is shown as a pair to demonstrate removable ball marker. Show your pride on the links! Serving our Military and Their Families for over 10 Years. If you have any questions about this product by Golf By MilitaryBest, contact us by completing and submitting the form below. If you are looking for a specif part number, please include it with your message.